Gaultier threw down the gauntlet. The Fashion World of Jean Paul Gaultier: From the Sidewalk to the Catwalk, opening today at Brooklyn Museum, marks a turning point in how major fashion exhibitions will be presented in the future, as well as the reach they can have. Making its way to Brooklyn after stops in Montreal, where it originated, followed by Dallas, San Francisco, Madrid, Rotterdam, and Stockholm, the show is a wild and imaginative romp through the mind of a fashion genius and one of the best I have ever seen. Hello sailors! Easily my favorite part of the JPG show. Amazing mannequins, the work of Jolicoeur International, and based on Gaultier’s wish to give the exhibit a theatrical aspect, talk, blink, and smile at you. They sing, they get sleepy, they close their eyes, and when they open them again, they look around the room. They are mesmerizing. It’s hard to imagine going back to seeing exquisite haute couture clothing—for women and men, another unique aspect of the exhibit—on featureless mannequins after seeing a show like this. JPG talks to you in English, then in French. I want to go to the party where people are dressed like this. It is wild to watch the mannequins’ expressions change! These virgins sing to you as you gaze upon them. Amazing! ...and took 180 hours to make. Gaultier noted in his remarks to the press that the exhibit was organized not chronologically but thematically, by things he loved. “The Odyssey,” for example, presents sailors and sirens and virgins, the trademark themes he has returned to repeatedly over his long career. “The Boudoir” brings us into the lingerie wardrobe Gaultier so loves and has done better than anybody else, featuring his beloved—and gorgeous!—corsets and cone bras. The combination of masculine and feminine are intertwined throughout the seven galleries, another theme Gaultier has always explored in his work. A fan-style corset for a man. Gaultier’s teddy bear, Nana, is at left, featuring the first cone bra he ever made! A case of slowly-spinning corsets. JPG and Madge, 1990. Photo by Herb Ritts. You can’t talk about Gaultier without bringing up Madonna, and the impact the costumes he made for several of her world tours, most famously, Blond Ambition, cannot be overstated. It’s hard to imagine that the tour would’ve been the runaway success it was without Gaultier’s designs and the pale-pink iconic corset Madonna wore is, of course, on display. Look too for a sly set of Polaroids showing the material girl in costume fittings for the show. Madonna’s iconic corset from the 1990 Blonde Ambition World Tour. Madonna tries on the suit and corset Gaultier made for her Blond Ambition tour, circa 1989-90. 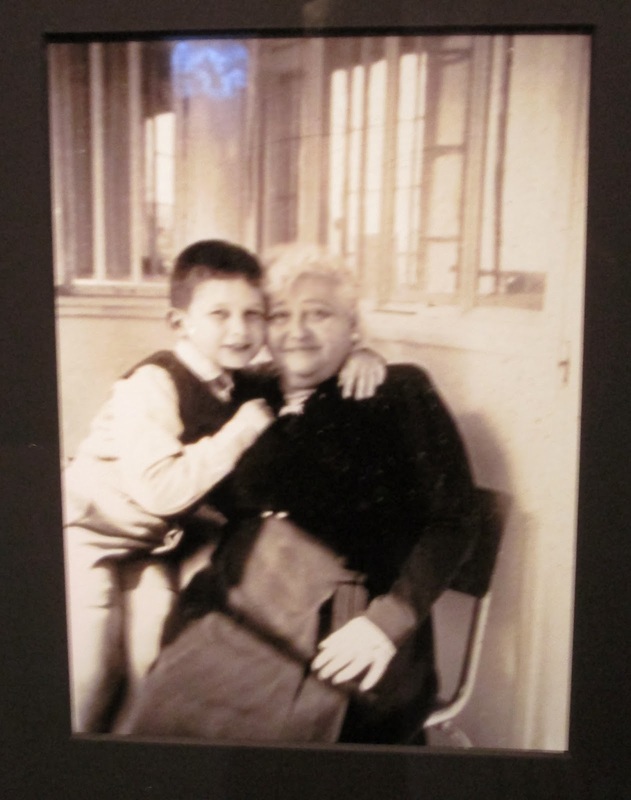 JPG with his grandmother, circa 1958. I love these personal touches. Among the sailor stripes, talking mannequins and spinning corsets, you will find—if you look for them!—snapshots of Gaultier with each of his grandmothers at different times in his life as well as the little teddy bear, Nana, wearing a cone bra Gaultier made for it as a child. These unexpected touches give the exhibit a personal feel. It’s not just a retrospective, it’s an entire world, one of inspiration and joy. 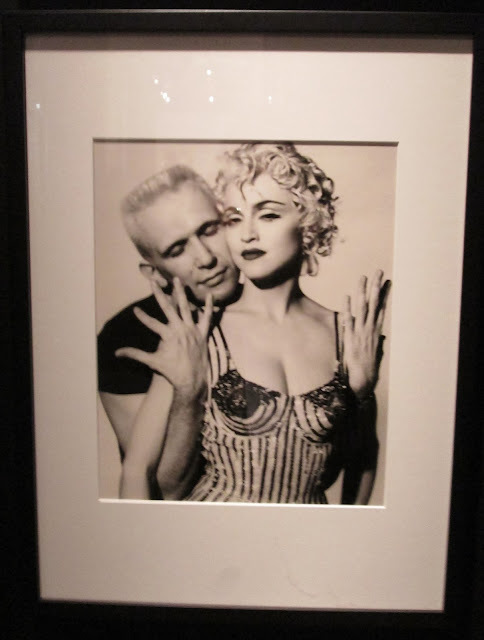 You get a real sense of where Gaultier came from and what he loves. A dress of beaded crepe georgette with cascade of lace veiling. Fabrication time: 105 hours. 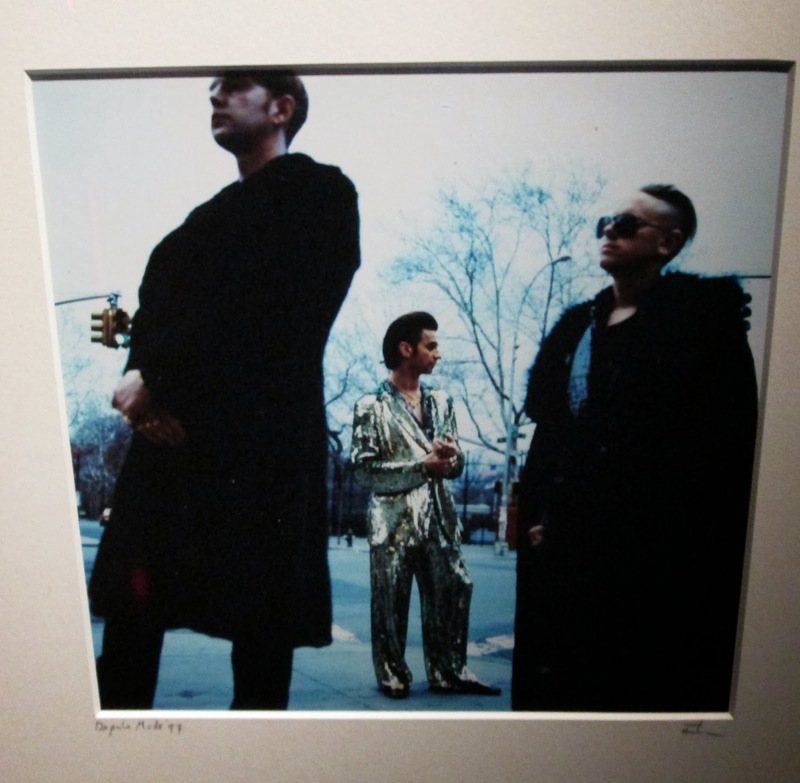 Why yes, that IS Depeche Mode in Gaultier, circa 1997. Remember that lamé suit on Dave in “It's No Good”? “Calligraphie” gown, fall/winter 2008-9, which took 295 hours to make! In detail. I love the intricacy here. And that shade of green! “La Mariée” haute couture wedding dress from fall/winter 2002-03. JPG playfully points to “himself” for the photographers. 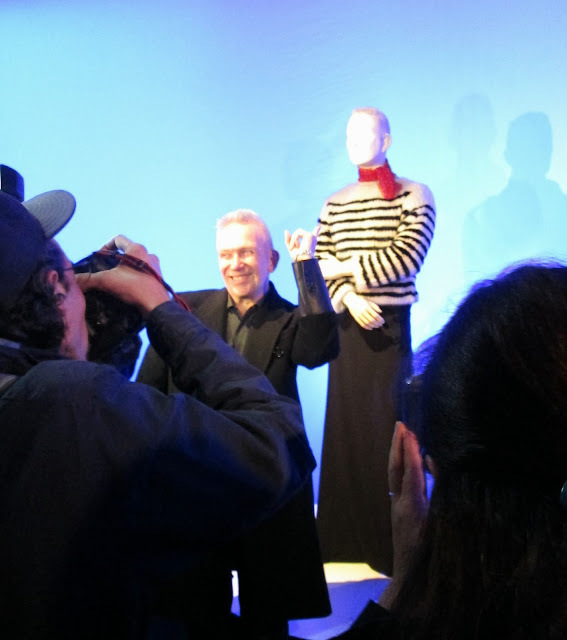 Gaultier, who is a delight to listen to, gregarious, charming, and fun, said it best when asked by a reporter what message he hopes the exhibit brings to people as it makes its way around the world. The Fashion World of Jean Paul Gaultier: From the Sidewalk to the Catwalk is on view at Brooklyn Museum through February 23, 2014. Jill dear-this is simply stunning. You live in such a fashionable and culturally rich part location. What an exhibit-amazing. I love the stripes, the photos with grandmas and that green (mesmerizing indeed!). Thank you so much for sharing this. I want to go! It looks so amazing. I've been to exhibits where they have mannequins like that and it is freaky and cool at the same time and truly adds an interactive layer to the exhibit. I saw this exhibition in San Francisco in 2012, and it was such fun. It was really wonderful to see so many iconic pieces. That said, I had seen the Yves Saint Laurent exhibition in Denver that previously had been in Paris (and I think Madrid) only a month before I saw the Gaultier, and there is a massive, massive difference between the workmanship of Saint Laurent and Gaultier. You've seen enough couture exhibitions, Jill, that I'm sure you noticed the same thing. JPG is creative, witty, inventive, fun, and so talented, but a real, true craftman? Weeeeeell, maybe not so much. I remember getting a foot away from one of Saint Laurent's Mondrian dresses and being absolutely unable to see a seam or stitch between those panels of color. True, exquisite artistry at the top of one's game there. Blew my mind. P.S. Still loving my little readers from your contest a few months ago! The one draw back of living in a smaller city is that we never get to see these amazing shows...so thank you for sharing! Thanks for the visit !I have a JP Gautier's teddy bear,with a little skirt and a "marinière"; I didn't know for the Dave Gahan's suit, it's amazing : I'm a big fan of DM too ! P.S. Aren't the Wink readers great? I use mine all the time. So glad you are enjoying yours! There is sincere admiration and also love in this article ;-) JPG is one the most charming designers ever... I am sure you will confirm. And many many thanks for promoting -other than JPG famous striped collections - my polka dot stoles. It's an honor to have ANNE TOURAINE Paris scarves featured on your blog. Jill - a comment on my blog post about the JPG exhibit directed me to your post - sounds like you loved the exhibit as much as I did! I was able to talk to M. Gaultier at the press preview, and I was at the Vintage Show the day he was there, but didn't see him. Sounds like you and I were probably crossing paths that week! It appears we follow a number of the same blogs too, you've got to love the six degrees of separation created by the internet.